Bellevue College’s first annual BC Illuminates festival launchedthis March, and it was outstanding. According to Vivienne McClendon, the dean of the BC library, “the goal of the festival is to have an annual event that celebrates the connection between creativity and the arts and technology. The festivalwas filled with Seattle-based keynote speakers, musicians, film makers, poets and even a free nacho bar for enjoyment. The majority of the event was held in the collaboration area of the campus library. The XR lab and the arts and culture events were held simultaneously. 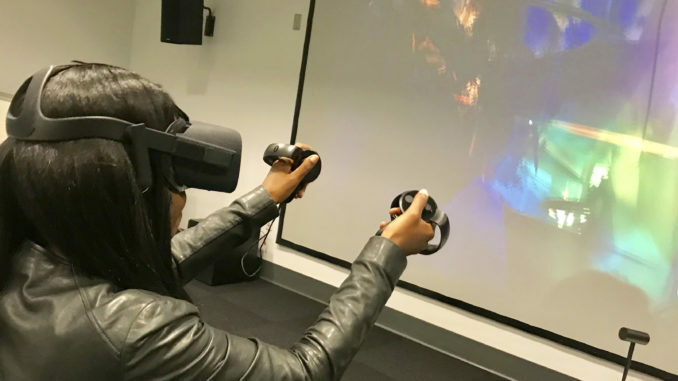 Friday included a simple open-house display of the lab, while Saturday hosted multiple speakers and virtual reality developers that even battled topics such as climate change. Though there may not be any talks right now, the XR lab is open whenever the library is open. The festival started with a talk from Ramón Concepción, an assistant director at BC’s multicultural services department. This was followed by a discussion with Audrey Bean, news editor for the Watchdog, and Unica Lee, founder of BC’s poetry club. Together, they showcased “Belletrist”, a literary arts journal that showcases the talents of BC students, both in print and online copies. BC illuminates wants to exhibit even more student flair in the upcoming years. If you have a story that you want to share, talk to student programs about being a presenter. Niko Stathakopoulos, the event coordinator of BC Illuminates stated, “It was hard to find out where students met where because there was a lack of a central resource. I think it would be great if there was more connection on campus.” Volunteer positions are also abundant, meaning that volunteer hours are as well. The next panel was on the evolution of LGBTQ+ representation in film and television, hosted by Matt Baume. Steve Mcintyre spoke for Minor Matters, a publishing company that tell stories through photography, which was followed by a comedy presentation featuring former BC alumni Kevin Saxby, misprinted as Natalie Holt on the pamphlets. BC President Jerry Weber opened the night by briefly stating that BC illuminates was meant to present “more diverse forms of expression.” His introduction was followed by Ken Jennings giving his talk on about the importance of having the right knowledge at the right time, without the use of search engines. The penultimate program was a quirky performance by Kimya Dawson, most widely known for her work on the “Juno” soundtrack. The night ended with the visually stunning stop-motion film, “Torrey Pines.” Clyde Peterson, the creator of the film, displaysa personal tale centeredaround mental health and gender dysphoria. The Saturday event opened with an interactive presentation once again by Unica Lee, this time to show off the work of her poetry club and its members. The biggest turnout was from Dr. Quintard Taylor, holding the most stage time out of all the guest speakers. Rather than his usual academic lectures, Taylor shared his passion project, BlackPast.org, an encyclopedic website that aims to educate internet users on black history all around the world. The project is free and managed by volunteers, so if you have any interest in African ancestry you can go to BlackPast.org to find ways to help. The next two programs featured Kelly Froh, the award nominated comic publisher, who divulged details on her local project “Short Run Comix and Art Festival,” and Azura Tyabji, who performed some of her poetry pieces that got her nominated as one of the top five youth poet laureates of the country. BC Illuminates concluded with the Bushwick Book Club, who presented performances by numerous musicians, and their songs inspired by the novel, “This is How it Always is.” The author, Laurie Frankel, joined them in a discussion on her own inspirations, and how it feels to inspire others.